Spring has taken her sweet time to arrive in Boulder County this year, but no one is complaining about the emerald blanket and late-season lilacs left in her wake. Cyclists are happy (the trails and roads are finally dry! ), and foodies are happy (a rain-free Saturday farmer’s market, and the tomatoes can finally go in the ground!). Why not get these happy people together for a bike ride, and a dinner, on a farm? The clever guys at Sports Garage bicycle shop will present the first of the Farm to Table Ride Series on June 6 at Sol y Sombra farm in Hygiene. Chef Hosea Rosenberg will serve a three-course meal after guests have worked up an appetite bicycling the back roads around Hygiene. Participants will meet at the elementary school at 4pm, ride about 30 miles on the paved roads that jog east and west of town, and have access to changing rooms and moist towlettes upon their return to Hygiene. * Dinner will begin around 6:30, just as the sol begins to cast sombra on the surrounding countryside. When I count the ways in which I am lucky to live in Boulder County, the cycling and the abundance of local produce rank in my top 5. These dinners will surely showcase some of the our finest of both. *The ride is optional; guests may arrive around 6pm for dinner only. Betsy, fantastic news and inspiring article! Two of my favorite things about Boulder County are also fresh produce and biking. 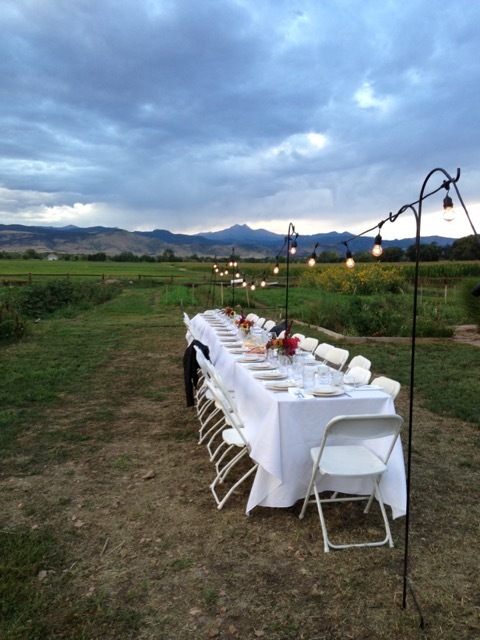 I’d love to see the farm to table chefs offer even more affordable options for the low to middle income residents of Boulder, so everyone can experience it!